There are very events in the world which can topple the human heart and mind as easily as this year’s World cup… “First ball of the ICC Cricket World Cup 2011..from Shafiul Islam to Virender Sehwag…smashed past extra cover and it’s a boundary…WHAT A BEGINNING ! !… 1..2..3.. the cricket world cup has finally kicked off with a blast !! The most awaited and the first blockbuster event of the decade is finally here…Its most welcome anticipation across the globe, especially, in the fourteen participatin gnations of which four were associate nations. Two groups, group A and group B were to form seven teams each. Group A would have Pakistan, Australia, Sri Lanka, New Zealand, Zimbabwe, Kenya and Canada battling it out. On the other side, Group B would consist of India, South Africa, England, West Indies, Bangladesh, Ireland and Netherlands contesting strongly. Top four teams from each group would qualify for the first stage of knockouts – The Quarter finals. No nation can ever have ceasing expectations from its national team. Every individual understands the intensity of the situation when one emerges as the true victors…but not many possess what it takes to be the world champions. This discussion is heading in another direction I suppose… so, for the time being, I keep this for a little later on the clock. As I was saying, the quality of cricket that would be played over the next 43 days would be of an immensely high standard. First match was a group B match as you already know I guess…between two sub continental sides, on one side being the strongest contenders and firm favourites Team India while on the other side were the unpredictable Bangla boys. As expected, the game went India’s way as Bangladesh in spite of putting a brave fight back, could not traverse beyond a total of 283 in their pursuit of a mammoth 370. Thanks to Sehwag who made a scintillating 175 to be adjudged as ‘man of the opener’ and which happened to stay as the highest individual score of the tournament till the very end of the tournament on 2nd April. But, sadly most of the games that followed were disappointingly one sided which made the ‘then’ Aussie captain Ponting raise a question on the inclusion of associate nations in such a high profile tournament. This comment certainly earned him lot more criticism after the LCD incident 😛. Over the days, we saw the top contenders bundling out the relatively weaker teams for mere totals below 200. Things were not that easy when it came to Group B. Bangladesh had a very fair chance of making it to the quarters for they would be having the home advantage in each game of theirs. The huge game between India and England turned out to be surprising rather nail biting with over 600 runs scored but ending on a disappointing tie. The shocker came a few days later when Ireland rose to the occasion and defeated the off-colour English… The Irish victory egged countless discussions about India’s chances while playin gagainst Ireland in their next match. The hero of the ‘English’ night Kevin O’Brien could not repeat his feat(112 off 63 balls) and the blues were back on their winning track. Another awaited match was Sri Lanka versus Australia which got abandoned owing to heavy shower after the 32.5 overs of play. Games went on as usual with Pakistan, Sri Lanka, Australia and New Zealand occupying the top four till the very end in Group A. In Group B, there were shocks and surprises, England beating the Proteas but themselves losing from a relatively much weaker side Bangladesh which had earlier been bundled out for a dejecting 58 (the lowest tournament score) by the high and mighty Windies. West Indies were going on really well only to fail as the end of the tournament approached. But, finally, the four teams that made it in Group B were South Africa, India, England and West Indies. Based on group standings,the pairs for quarters were decided – Pak v WI, Aus v Ind, SL v Eng and NZ v SA. It was a ‘highly’ low scoring game with the inaugural champs being bundled out for just 113 and Pakistan chasing it down successfully with 10 wickets to spare. Next came the big one, Aus v Ind… world no. 1 v world no. 2… a contest too exciting beyond words…a clash impossible to wipe off from memory. Since, these are do or die games, obviously, one team would be ousted in the hunt… but who? It began with India fielding first; they tried their best to stop the boundaries, convert their ‘2’s into ‘1’s – a visible welcome change in their fielding – all for the better!! Though, there was one man who defied the Indian bowling for the major part of the first innings –Ricky Ponting with a patient and well deserving ton. Aussies managed to put up a decent total of 260 on the board assisted greatly by the blitzkrieg cameo from the man well known for it – David Hussey. To be honest, India really had a task in hand. A good start and enough backing from the middle order was all that was required. However, the team lost its steam midway with about 70-75 odd runs to chase with Yuvraj and Raina left as the only established batsmen. How does that matter, for Raina and Yuvraj, according to me played the most matured innings of their careers to help India cruise to the semis…Here, we get our first semifinal pair Ind v Pak, a delightful treat for both nations !! No one had exceedingly high expectations from England, who after the Ashes, were not really the England we all had known. It was pretty easy for the Sri Lankans to chase the total set by England which was a modest 230. Stars of the match were Tharanga and Dilshan, the SL openers who took the gameaway from the English easily, leaving them in tatters. Yes, you are right, a 200+ score was chased with 10 wickets left in hand. Amazing, isn’t it? In the final quarters, 70% odds were in the favour of the Proteas owing to their all round brilliance.Restricting the kiwis to a small total of 221 is definitely laudable, and deserves applause. But, I bet what came up next was damn unimaginable even in a nightmare for every regular cricket watcher out there. What seemed to be the easiest of tasks turned out to be a mammoth unfulfilled dream in the end asthey crumbled for just 172 runs on the board, shocking everyone… an unbelievable unhappy exit for oneof the best teams in the world..with this, revealed was the other semi final pair SL v NZ. jinx. The Blackcaps were to bat first; Once again, they put a small total, this time, 217. Not much was left to be honest, even after NZ’s sparkling bowling performance the other night versus South Africa. They gave it all they had; managed to take the game upto the death overs only to be disappointed in their WC hunt yet again. Their dream to covet the golden beauty was shattered for the sixth time in semis as SL cruised to the mega final on 2nd April. The biggest match was just one step away… here comes 29th March and with it the second prefinal orrather the ‘mini final’ since it was between the two arch rivals, two sub continental giants, 2 champions of the season – Ind and Pak, which I am sure must have grabbed more eye balls than any other match but the final in the tournament. The match began with the Indians batting first and every person glued to his seat. I won’t call the score put up stunningly breath taking after the hurricane sort of start our classy openers gave us. The game was put in reverse gear when Sehwag departed after his quick fire 35. In form Yuvraj’s subtle dismissal for a duck off a beautiful yorker from Wahab Riaz left us gaping with mouths wide open. Dhoni made a tentative but useful 25, then he too was dismissed giving another chance to the critics to raise queries on his batting abilities. Had the men in green not dropped the master blaster 4 times, the result would have been different most probably. Just when hopes were turning bleak, came Raina head on. Really, why to fear when Indian tailender is here? Batting powerplay was put into optimum utilization as India managed to post 258 at the P.C.A. stadium, Mohali. It was a slow start for Pakistan; The ‘Danger man’ Kamran Akmal was dismissed early on. The Indian bowlers capitalized on the start and the high quality fielding did not allow the Men in green to bounce back strongly. At one stage, they were left tottering at 150/6. Though there was a shimmer of hope from Afridi’s usual short term but dangerous hammering, they could never really get back. Misbah’s batting was highly criticized; the guy tried to fire with his willow towards the end but in vain which made the critics criticize all the more that “if he was capable of such shots over the rope, then why didn’t hego after the bowling earlier?”. All the better for India…as they bundled out Pakistan for 229. “The clash of the titans”… was banging hard at our doors waiting to be let in. One cannot ask for more than this… a sub continental final for the first time in World Cup history… between two prodigies…India tigers v Sri Lankan lions…Who would succeed in out facing the other? Which year will be repeated –1983 or 1996? Which team will be engrossed in jollification and which side will take a dip in the ocean ofdepression? The solutions to these queries remained obscure till the end. It was an extraordinary final right from the outset; We saw a toss being done twice at the end of which SL skipper K. Sangakkara elected to bat first. FUNNY BUSINESS!! It would perhaps be the last world cup for the world’s best ever batsman and bowler…yeah SRT and Muralidharan, sad but true …To be factual, a WC win was the only missing feather in God’s cap. And every member of the Indian squad wanted to fulfill this aspiration of the Genius. as a victim to the web spun by Bhajji. India was doing a dream job…stupendously electrifying on the field and many accurate dot balls. But who in the wildest of dreams had thought that Sanga and Jayawardene would break free and target almost one delivery in every over, over the rope. However, things went on smoothly till Zak came back for his third spell. Pretty economical in his first two spells going for just16 runs in 7 overs, he was easily the pick of the bowlers till then. Sri Lankan batsmen turned into run machines to leave Indians in despair earning 63 runs in the last five overs (batting powerplay) to post a more than competent defendable total aided greatly by Jayawardene’s quick unbeaten ton. Indians had the worst possible start, losing its invaluable openers for just 31 runs… I bet SL must have fancied its chances then but a patient partnership between Gambhir and Kohli ensured that it won’t be that easy a task for the blue islanders. Just when things were beginning to look sanguine, Kohli got dismissed. In came MSD, ahead of the superstar of the tournament Yuvraj. This definitely must have raised countless eye brows for the skipper was not in the best of batting forms. MS Dhoni slammed back really hard at his critics as he along with Gambhir posted a 100+ partnership to take the game away from the Sri Lankans neatly just when Gambhir missed a ton, unfortunately getting out on 97. Not deterred by Gauti’s dismissal, Dhoni and Yuvraj accomplished the remainder of the task achieving the total with a huge sixer with more than an over to spare. 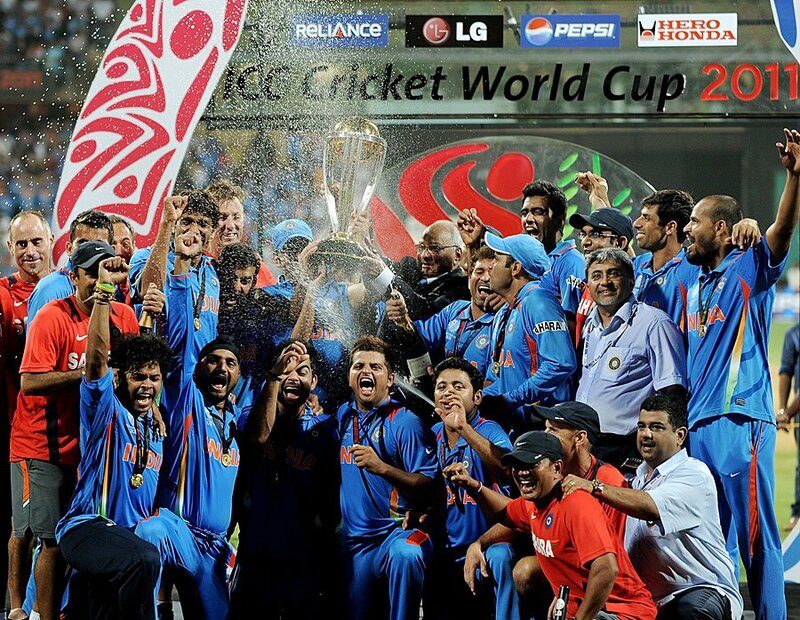 INDIA IS THE CHAMPION OF CHAMPIONS. Fireworks all over the Wankhede illuminating the sky. The nation rejoiced like never before. The dream of 1.2 billion was realized finally after a long wait of 28 years. Finally, history is recreated or rather excavated after 28 years. Unbelievable, isn’t it? A highly emotional moment for each cricketer in the team…all dissolved in tears of joy and disbelief for they succeeded in keeping their word to a Genius and the entire democracy which on a whole is enamored of cricket more than any sport. After the victory lap, there was the much awaited presentation – The best ever skipper in this world bagged the ‘Man of the final’ for his unbeaten 91 ornamented by a fabulous catch of the SL skipper and a fantastic run out while Yuvraj scalped the man of he tournament for his 350+ runs and 15 handy wickets. Cheers Yuvi!! A greatly dejected SL skipper admitted the Sri Lankan authority being out flanked by the superior Indians. Ecstasy was being pumped in each Indian heart as the blues coveted the much craved crown…the glittering beauty…the WORLD CUP. The only sad thing amidst all this jubilance was bidding a mournful farewell to the real architect of the triumph – Indian Coach Guru Gary Kirsten who would no longer continue as the Indian coach because of his other commitments. So, here ends an eventful chronicle in the history of Indian Cricket. Sachin’s Mumbai fairy tale finally comes true. And I bet it will take another ‘280’ years in the least to get tired of seeing the winning clicks. So, here we leave, promising to meet after another four years in 2015, next in Australia and NewZealand…till then hail to Team India…hail to MS Dhoni and hail to the Little Master !! Posted on April 7, 2011, in india, World Cup and tagged 2011, Ashish Nehra, Australia, gautam gambhir, india, ms dhoni, Munaf Patel, New zealand, Pakistan, sachin tendulkar, Sri lanka, virat kohli, virender sehwag, World Champions, World Cup, Yusuf Pathan, Yuvraj singh. Bookmark the permalink. 4 Comments. Awesome @Pallavi. Keep it rolling! Really great work..Yuvraj and Zak were the two main reasons behind India’s victory! Good to see Kohli and Gambhir handle pressure!